90-day programs have become successful for a number of reasons. 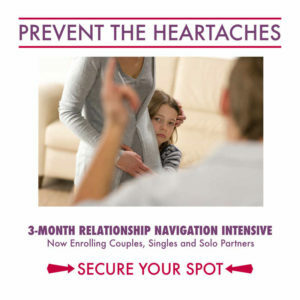 The format allows you to integrate the knowledge you gain into your life through experience — self reflection, coaching, and practical modifications of behavior patterns which lead to a full understanding of how to consciously and successfully navigate the differences between you and your partner in ways that work to fortify, deepen, and EXPAND the love you share. Every individual is unique, and it takes time to work out new ways of seeing the world and fine-tuning what works for you in the context of a relationship. Whether you are looking for the love of your life or you are working on how to make your relationship the best it can be, 90-day programs are designed to inspire you and to help you manifest real and lasting change in the way you relate to others. The 90 Day Programs are fully customized to fit your current situation. All the programs include 12 hours of Coaching along with The Relationship Navigation System which is a combination of Home-Study Audios and Action Guides. Listening to The Relationship Navigation System Audio material and doing the accompanying Action Guides on your own time will allow us to maximize our coaching time together, because we’ll be able to spend less time introducing new concepts, and more time applying the material to your experience. As you listen to The Relationship Navigation System audios, we’ll schedule your Coaching Calls and spend time integrating the material in a way that works for you and your relationship. Whether you’re already in a relationship, dating, or just starting in a new relationship, learning the differences between men and women, and how to navigate those difference will make an immediate difference in your relationship experience. It will help you experience more love, joy and peace in your life. By taking the time to work through examples from your own life and apply your new knowledge about how the masculine and feminine dynamic works, you will gain skills to be effective with your partner, with your family and at work. 90 Day Relationship Reboot – Have you been facing ongoing challenges in your marriage/relationship that are making you question whether you should stay together or break up? 90 Day Reboot for the Brokenhearted – Has your heart been shredded by bad breakups? Afraid to put yourself out there? Wondering where to start? 90 Day Precommitment – Are you wondering if your new love is your lifetime partner? 90 Day Premarital – Are you ready to get married? 90 Day Marriage Year One – Are you in the first year of marriage trying to deal with the realities of life together that you weren’t prepared for? 90 Day Parenting Year One – Are you struggling to keep your relationship together since your little one arrived?